I dug the evil stocking out of its lair to get an idea of ﻿what I face. Tomorrow has been designated “Evil Stocking Day” and I had to be mentally prepared for what I would face. I’m at the duplicate stitch portion and then I just have to knit the heel, foot and toe. It really isn’t a lot but I have ends to weave in first and that will be a bit of a chore. I’m trying to come up with something to dangle like a carrot on a stick for getting this done. Currently I’m thinking if I can have it mostly done by Sunday we’ll try a new to us ice cream stand that is still open. Ice cream can be a very good motivator. How do you motivate yourself to get things done that you don’t want to do? 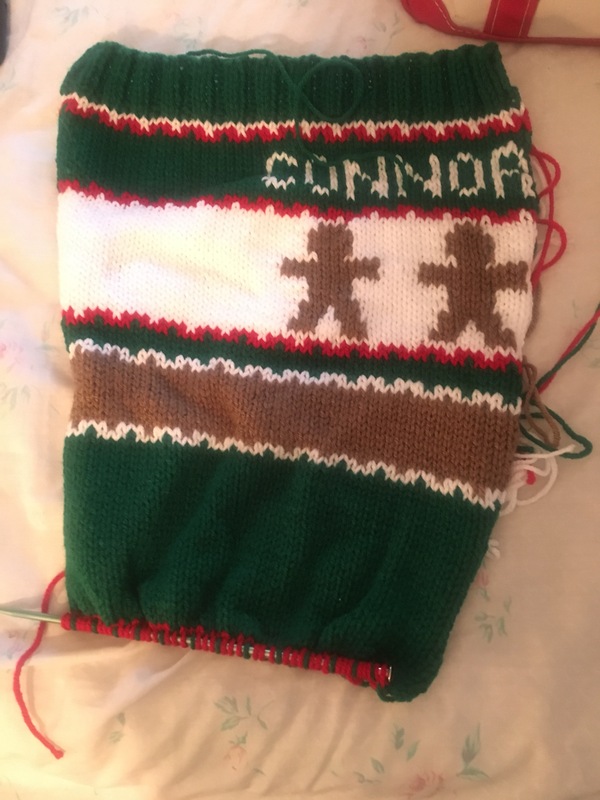 This entry was posted in Guilty Pleasures, Knits, Knitting, Those crazy holidays, yarn!. Bookmark the permalink. You are so good to dig out that stocking! It must be the day for it as I dug out my evil cross stitch rug:(. If I don’t like it, I stop doing it. I have learned to not tell people I plan to make this or that for them just in case I hate the project. They learn it’s for them when it’s done. I guess it’s tough with the stocking, since the name is on there, it’s obvious who it’s for. I’d motivate myself here by saying, “only awesome knitters can pull this off well in acrylic.” I mean really, color knitting with Red Heart super saver? You’re an awesome knitter. That’s very hard! I love the vintage vibe of this stocking. You go with the intarsia work. That’s a really good question you’ve asked. I’m a procrastinating queen so usually last minute adrenaline fuels me. Like for instance, I need to get up on my swap items that have to mailed off by November 15th. I’m dedicating today and tomorrow to work on what I can but after I get through blogs today. I just don’t do them! Bwahahaha!!! I bribe myself, mostly 🙂 If it’s a small project, I try to just power through it and then reward myself with something I really want to do right after. For big evil projects, I break it up into smaller bite-sized bits of evil.